Greg Aiello explores Alaska's Wrangell-St. Elias National Park with two twin adventurers, Brittany and Alyssa. Watch as they travel down into the depths of a glacier, explore caves and hike through the vast wilderness. Alaska is big, bold and wide open. For the unspoiled essence of the wild, Alaska is tough to beat. Home to eight U.S. national parks, Alaska is a wide-open paradise that calls to those with a spirit to explore. Today, Greg is taking two twin sisters who love to travel on a tour of Wrangell-St. Elias National Park, a park full of extremes, with massive peaks, glaciers and dense forests. In addition to being one of the largest national parks in America, Wrangell-St. Elias is also one of the most difficult to reach. It's an eight hour drive from Anchorage, with the last stretch being along the McCarthy road, a dusty bumpy path through the wild. While the drive is long, it's also very scenic, with plenty of places to stop and take in the beauty of the Alaska wilderness - sixty-one miles of bumps, dust, gravel and breathtaking views. As Greg and the twins stop to see the breathtaking view up a river canyon, it's pretty windy, but one good thing about the wind in Alaska? It keeps the mosquitos away. That old joke about mosquitos being the state bird of Alaska isn't far off. They're more than just a nuisance, especially in early summer, when they can nearly drive you crazy. After a long day of driving, they finally hit the end of the road, where a footbridge crosses the Kennicott river. Wrangell-St. Elias isn't your typical national park - it's remote and services are limited - but for Brittany and Alyssa, it's no problem. Although the twins sense of adventure is healthy, they both have a big fear of heights, so the group teamed up with Elias mountain guides to see if they could help these women face those fears. Nearby Root Glacier is a top spot for ice climbing, and our guides just found a feature a few days before that would be the perfect way to get the twins and Greg way outside of their comfort zones. They're going to repel into the cavern in the ice and repel their way back out. But first, they set out on a fun hike through the remains of the Kennicott copper mine to the Root Glacier. Once they arrive at the glacier, they change shoes to help them walk on the surface, wearing crampons to help steady them on the glacial ice. The technique is difficult, but they get the hang of it after awhile. Most of Alaska's mountains are still covered in glaciers, but some glaciers, like the Root, are retreating, melting faster than they can move forward. The ice that forms glaciers is hundreds of thousands of years old, super compressed over time and under the weight of centuries of falling snow. Moulins are formed when surface rivers of melting ice carve tubes into the glacier, sometimes hundreds of feet deep. Today, the guides tell them they've recently discovered a new moulin, one so deep that you can't even see the bottom, that they will explore together today. To do it, they're going to repel into the void and then climb back out. While the crew eats lunch, the guides put ice screws into the glacier that their ropes will hang from. With the camera crew lowered into position, it becomes time for Brittany and Alyssa to face their fears. They have to walk backward into the void, an idea that makes both twins nervous. "It's the most unnatural feeling when they're telling you to lean back onto this thin rope into this dark, unknown hole," says Brittany. One of the hardest parts of this kind of climbing is trusting your gear. It goes against all kinds of survival instincts to lean into a hole, away from good footing. It makes it even harder if you peek over the edge, into the void below. The thin rope is the only thing between survival and an icy fall into darkness. Brittany and Alyssa did a great job, despite being legitimately afraid. Next, it's Greg's turn to go down into the void, going even deeper into the heart of the glacier. He's going to go down so deep, where the blue ice turns to black. "It's so cool to be in a place when every cell in your body is saying, 'You should not be here,'" says Greg. When he really stops to think about where he is and what he's doing, he reflects on how incredible glaciers are. Thousands of feet of super compressed ice, thousands of years old, slowly moving like a giant river. "It's a beautiful place," says Greg. "Otherworldly." With the Alaskan sunset about as low as it will go in early June, the team packs up their gear and heads back to the Kennicott Glacier Lodge. 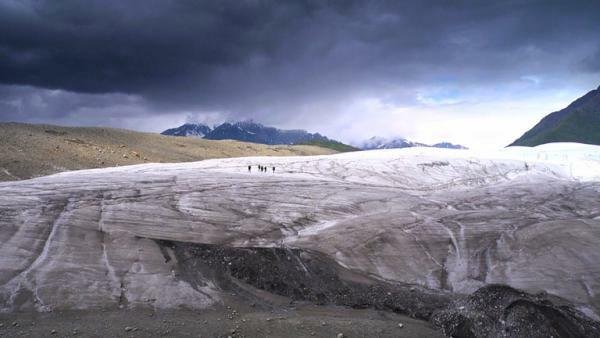 Walking on Root Glacier and exploring its depths was something none of them will forget. On day three of their trip, they have another adventure set up by Elias mountain guides which will take them to the toe of the massive Kennicott glacier to paddle in kayaks among the icebergs and glacier face. But before heading out to the water, they drove through the very small town of McCarthy to get geared up at the guide house. While the water is calm where they're going, other conditions make it a place that demands a lot of respect. Water temperatures are right about 32 degrees, and icebergs can roll unexpectedly. They drive out to the face of the glacier, and after a quick safety briefing, it's time to hit the water. Once on the water, they explore the constantly changing face of glaciers and to see a special feature the guides have found recently. As they paddle through the water, the heat of the day causes the glacier's surface to melt a bit, kicking off rocks on its surface into the water. During long summer days, with temps in the 70s, these glaciers are constantly melting and changing shape. The team even tries tasting a piece of thousand year-old ice. After kayaking, the guides have another surprise in store for the trio - a cave at the toe of the glacier. The entrance to the cave is tricky, with a steep, rocky grade. Above it, melting ice can create a shower of rocks at any time. "We had to be really really careful entering the tunnel because there's actually loose rock everywhere," says Brittany. One of the guides sets out on a lookout position to keep an eye out for rockfall as they go into the cave one at a time. Once clear of the hazards of the cave entrance, the surreal world of this frozen grotto leaves jaws dropped and minds blown. Melting water is a big part of the glacier's anatomy. A complex hydraulic system is found at every level of the glacier. At this cave, melting water on bedrock has slowly carved an immense tunnel underneath. After a perfect day of paddling and exploring the glacier, it's time to head back to the lodge, reflecting on the beauty they've seen. "This trip for me has been really energizing and kind of re-inspired me," says Brittany. The inspiration of travel can come from anywhere. For Brittany and Alyssa, it's more than just seeing new places. It's experiencing life together and sharing in that joy that comes from exploring. Whether that's a park or a new trail close to home, or a land as majestic and expansive as Wrangell-St. Elias National Park in Alaska, it's not about where you go. It's about what you find in yourself when you get there. For more on Wrangell St. Elias National Park, visit nps.gov. For more on the Kennicott Glacier Lodge, visit KennicottLodge.com. For more from St. Elias Aipine Guides, visit StEliasGuides.com. With plans to explore Wrangell-St.Elias National Park, the Motion team first has to get there, traveling hours on a remote road, rife with beautiful vistas and pesky mosquitos. It takes everything that twins Brittany and Alyssa have to overcome their fear of heights when they're asked to repel backward into a massive hole in Root Glacier, so deep you can't even see the bottom. As rocks from the melting glacier fall into the water, the Motion team paddles at the foot of the glacier, exploring the incredible water system and natural wilderness. After their kayaking adventure, Brittany, Alyssa and Greg explore a giant cave underneath a glacier, getting to see the otherworldly beauty that lies under its ancient ice. Go behind the scenes as Greg Aiello explores Alaska's Wrangell-St. Elias National Park with twin sisters.